“After the individual was shot he went off the highway into the side median,” said public information officer Mark Economou. 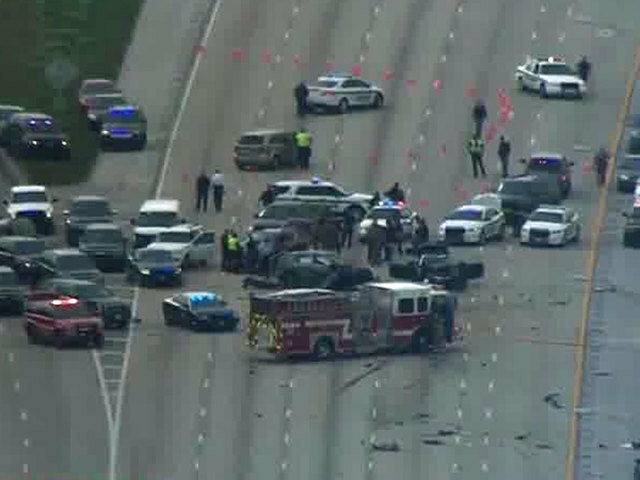 Separate NewsChannel 5 sources confirm that includes the deputy-involved shooting on I-95 and the shootings connected to it. Forensic testing is underway to determine whether the two shootings and shutdowns of I-95 Wednesday are related. shot by a PBSO deputy on I-95 in Lantana could be the same suspect who shot a man on I-95 in Boca early that morning. Long before the Florida Highway Patrol and the Palm Beach Sheriff’s Office shut down I-95 between Lantana and 6th Avenue after a wrong way crash and deputy involved shooting, police in Boca shut down I-95 for a separate shooting. The murder victim in the Boca shooting has been identified as 29-year-old Edvin Milkevic. To be clear, it’s possible that the forensic tests could show the incidents are not connected. However, those sources say it’s certainly a big part of this investigation. Meanwhile the heartbreak and loss is starting to set in. At Pasta And Restaurant in Margate where Milkevic worked for the last several years there was a sign posted on the door. “These people. Close-knit family. They did a lot for their people. It’s unfortunate,” said Penelope Chimowitz. She owns the salon right next door. Chimowitz became friendly with Milkevic over the last few years. She is just one of so many now searching for answers.